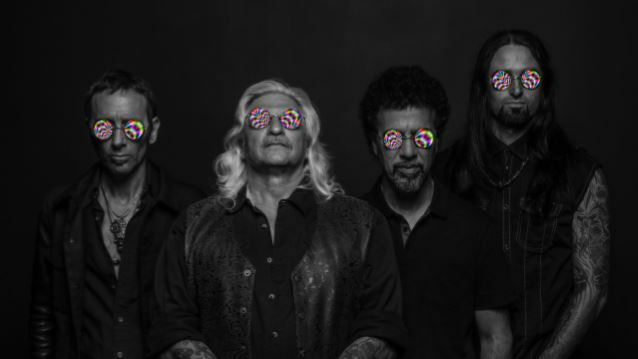 THE APOCALYPSE BLUES REVUE (formerly BLUE CROSS BAND), the new project from GODSMACK's Shannon Larkin and Tony Rombola, has inked a deal with Provogue. The band's debut album will be released later in the year. THE APOCALYPSE BLUES REVUE, whose lineup is rounded out by frontman Ray Cerbone and bassist Brian Carpenter, honors blues traditions, while etching their stamp on the genre in blood. "As far as blues goes, APOCALYPSE BLUES REVUE is a little heavier, a little darker, and has some punk rock attitude in the lyrics," affirms Shannon. "We wanted to make something deep that will provoke thought. It had to be evil, though. We're not trying to make it happy. It's called blues for a reason! It was also an opportunity to show the world what a phenomenal guitar player Tony is." Shannon witnessed Tony's knack for the style firsthand while writing together for GODSMACK's 2010 offering "The Oracle". Burnt out on metal and hard rock, the pair would loosely jam without boundaries. During one impromptu session in their Southwest Florida rehearsal spot, the drummer laid down a slow, simmering groove, and another side of the guitar player reared its head. Provogue/Mascot Label Group's CEO Ed van Zijl was equally impressed when he heard the band for the first time: "This is a very cool band and they made a very cool record," he says." Melodic and groovin' blues rock with touches of Hendrix and THE DOORS. The whole album sounds very organic and natural, great songs and vibe as if they have been playing together for a long time. I love it!" Talking about joining the label, Larkin adds: "We looked at Mascot's roster and track record, and made the decision on the spot. We didn't feel we needed to shop the band to any other labels; it just felt too perfect."